This article explains the mechanics and usage of the TechNet Wiki Widget for Windows 8. Like it! Pass it on! The TechNet Wiki Widget (TWW) is a Windows 8 App to help manage, monitor and aggregate TechNet Wiki articles. The initial release focuses mainly on the RSS features of TechNet Wiki, and also has the ability to Tweet an article to your Twitter account. 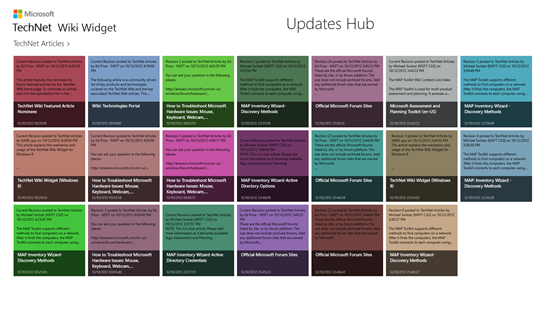 This app is now available in the Windows Store. 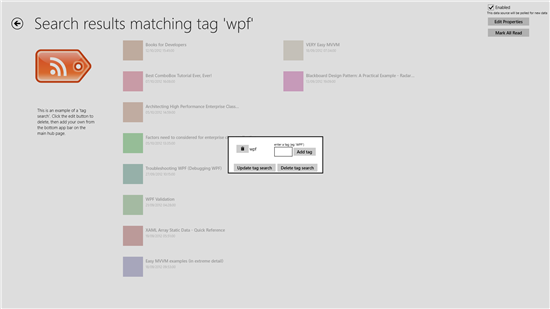 Simply swipe in from the left, click search, type in "TechNet" and search the Store. Behind every great Wiki is a great RSS feed. TechNet Wiki is no exception. 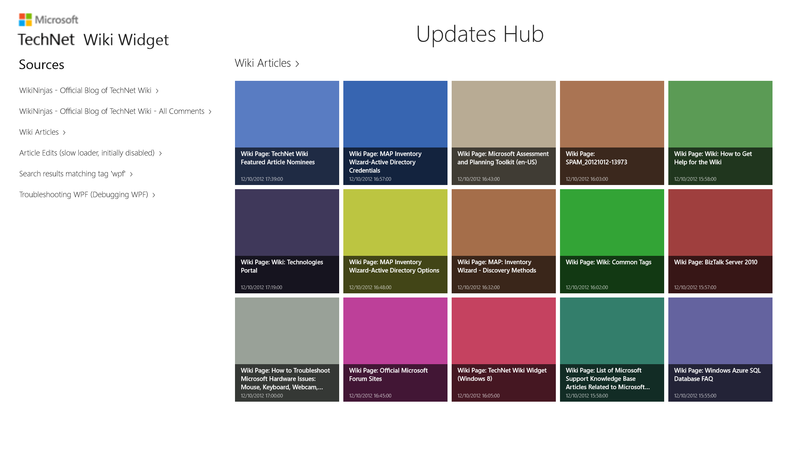 You can follow your favourite tags, blogs and article updates with any RSS reader you like. 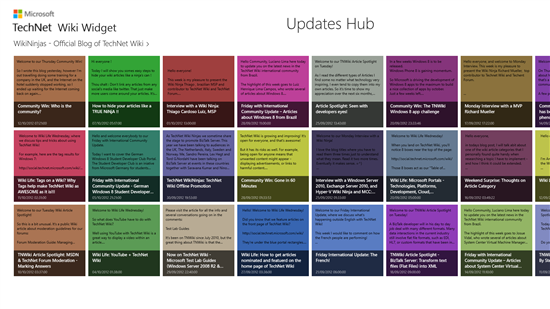 TechNet Wiki Widget is initially just a collection of the most relevant of these feeds, and a convenient way to add tag searches, without manually fiddling around with URLs in the address bar. The TNWiki Widget has a number of fixed feeds, which present the most important content that the Wiki has to offer. You can disable a feed if you need in the feed details page (2nd level). 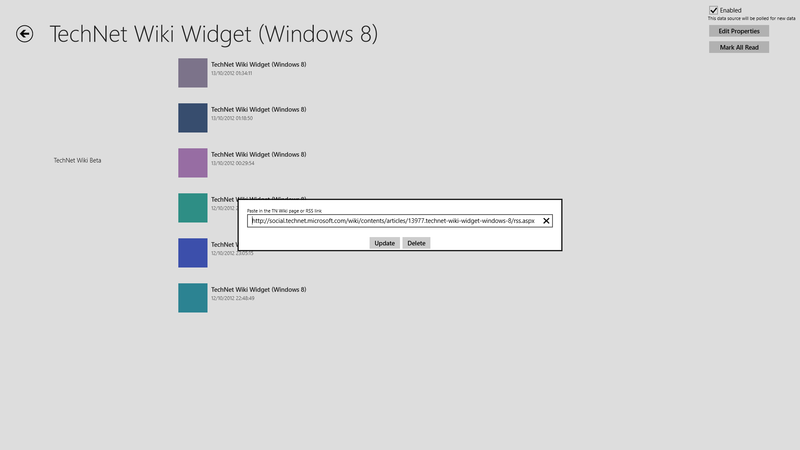 As per Windows 8 standard styling, click a title to go to the details page. This feed monitors the Wiki Ninja Blogs. 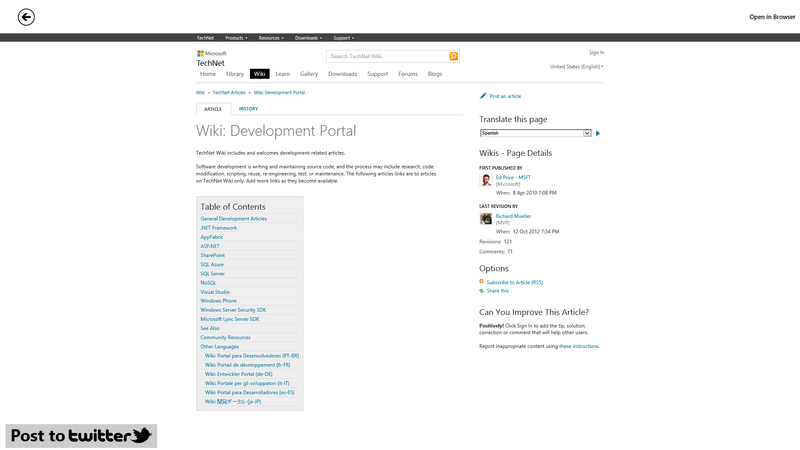 Each day of the week has a different subject, and all are about TechNet Wiki. Weekend Surprise! - ...are you feeling lucky, punk!? At the heart of TechNet Wiki are the Wiki Ninjas, shaping the community and informing readers of new developments and concepts. This is a list of new or significantly updated TechNet Wiki articles. This is a great source to watch for new content and improving submissions and removing spam. A list of all recent TechNet Wiki article updates. This RSS feed is very slow to return data. It can take up to a minute before it finishes updating! Because of the slowness of this feed, it is initially disabled, so as not to give you a bad first impression. If you want to drill down to this finer level of Wiki activity, you can switch it on in the feed details page (click the title). 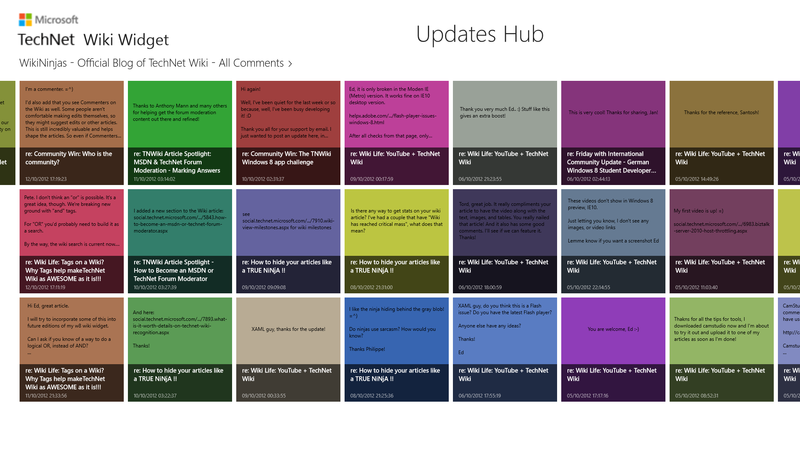 As well as the fixed feeds above, TWW also allows you to define your own custom feeds. These are either Tag Searches, or Article Watches. Both custom feeds are added from the buttons on the bottom App bar. All wiki articles are categorised by their tags. A good way to follow a particular interest is to monitor for new articles with relevant tags. One way to search for your desired tags is to click on a link from the Tag cloud, then fiddle with the URL in the address bar. This feature however, allows you do define the tag(s) with a simple user interface. If you have written an article, you may want to watch it for updates. Or if you find an interestingly evolving wiki article you may want to follow it for changes. With TWW, you can cut and paste it's URL (or it's RSS feed) into an Article Watch. When you click on one of these items, you get the CHANGE page, showing the difference between this and the last revision. Here is an example of the "Article Details" page (3rd level). If this article is of interest, you can easily Tweet it to your Twitter account. A future version of TWW will allow you to customise the Tweet, and will include other social site features.